The forthcoming Kickstarter to fund Uncanny Magazine’s fourth year will also cover the cost of the Disabled People Destroy Science Fiction double-sized, guest-edited issue. The Kickstarter will launch July 24 and run through August 23. Each issue of Uncanny from Hugo Award-winning editors and publishers Lynne M. Thomas and Michael Damian Thomas contains new and classic speculative fiction, podcasts, poetry, essays, art, and interviews. We at Uncanny are absolutely thrilled to be taking over the Destroy series of special issues from Lightspeed Magazine. We are so honored that Lightspeed Magazine Publisher/Editor-in-Chief John Joseph Adams trusts us enough to pass the torch so we can publish Disabled People Destroy Science Fiction with a phenomenal roster of guest editors who we know will find some amazing contributors. Pieces from Uncanny Magazine’s first three years have been finalists for 28 different awards including Hugo, Locus, Nebula, and World Fantasy Awards. Uncanny Magazine has won a Best Semiprozine Hugo Award, a Parsec Award for its podcast, and Hao Jingfang’s Uncanny Magazine story “Folding Beijing” (translated by Ken Liu) won the Hugo Award for Best Novelette. 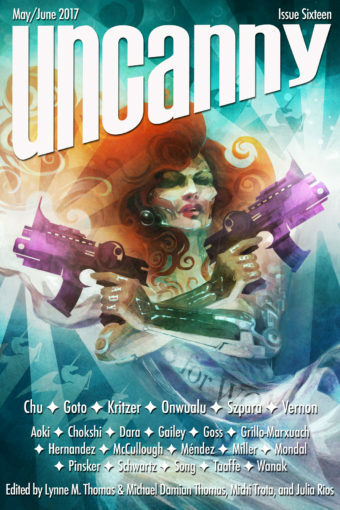 Uncanny Magazine issues are published as eBooks (MOBI, PDF, EPUB) bimonthly on the first Tuesday of that month through all of the major online eBook stores. Each issue contains 5-6 new short stories, 1 reprinted story, 4 poems, 4 nonfiction essays, and 2 interviews, at minimum. Material from half an issue is posted for free on Uncanny Magazine’s website once per month, appearing on the second Tuesday of every month (uncannymagazine.com). Uncanny also produces a monthly podcast with a story, poem, and original interview. Subscribers and backers receive the entire double issue at the beginning of the issue’s first month before online readers. Elsa Sjunneson-Henry is a partially deafblind speculative fiction writer and disability activist. Her short fiction is included in Upside Down, Inverted Tropes in Storytelling, Fireside Magazine, and Ghost in the Cogs. She also writes for tabletop roleplaying games, and was part of the ENNIe award winning staff for Dracula Dossier. Her nonfiction has been included in The Boston Globe, Uncanny Magazine, Terrible Minds, and many other venues. She teaches disability representation at Writing the Other, and recently spoke at the New York Public Library on this topic. She is the assistant editor at Fireside Magazine. She has a Masters in Women’s History from Sarah Lawrence College, and uses it to critique media representation of disability from all mediums. Dominik Parisien is the co-editor, with Navah Wolfe, of The Starlit Wood: New Fairy Tales, which is a finalist for the Shirley Jackson and Locus Awards, and the forthcoming Robots vs Fairies. He also edited the Aurora Award-nominated Clockwork Canada: Steampunk Fiction. His fiction, poetry, and essays have appeared in Uncanny Magazine, Strange Horizons, ELQ/Exile: The Literary Quarterly, Those Who Make Us: Canadian Creature, Myth, and Monster Stories, as well as other magazines and anthologies. His fiction has twice been nominated for the Sunburst Award. He is a disabled, French Canadian living in Toronto. Judith Tarr… hates writing bios of herself. She would rather write historical fantasy or historical novels or epic fantasy or the (rather) odd alternate history, or short stories on just about any subject that catches her fancy. She has been a World Fantasy Award nominee for her Alexander the Great novel, Lord of the Two Lands, and won the Crawford Award for her Hound and the Falcon trilogy. She also writes as Caitlin Brennan (The Mountain’s Call and sequels) and Kathleen Bryan (The Serpent and the Rose and sequels). Caitlin published House of the Star, a magical-horse novel from Tor, in Fall 2010. The paperback appeared in November of 2011. She is dancinghorse on LiveJournal, Facebook, and Twitter. S. Qiouyi Lu is a writer, editor, narrator, and translator; their fiction and poetry has appeared in Strange Horizons and Uncanny, among other venues, and they currently edit the quarterly speculative flash fiction/poetry magazine Arsenika. They are a dread member of the Queer Asian SFFH Illuminati and enjoy destroying speculative fiction in their spare time. They live in Los Angeles, California with a tiny black cat named Thin Mint. Find out more at s.qiouyi.lu or follow them on Twitter at @sqiouyilu. This entry was posted in Like Show Business and tagged SFF in Translation, Uncanny by Mike Glyer. Bookmark the permalink. As the spouse of a woman with disability, I am so looking forward to this. And will support it. May this be successful. I’m looking forward to it. Oh this is fantastic! Looking forward reading the 4th destroy issue!